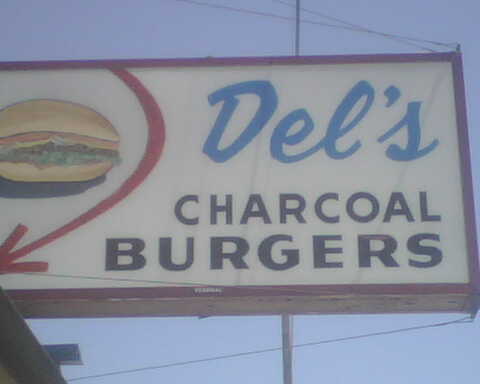 Ogre has had a hankering for Del’s Charcoal Burgers for a few days now and planned to take Benji here for lunch a few days ago. I’ve been working downtown the last few days and made plans to meet them for lunch. Ogre called me and I made sure everyone was tucked in at work before leaving, drove the further distance to the restaurant and STILL beat Ogre and Benji to the restaurant by a good 10-15 minutes! Ogre says it was because as he was getting ready, Benji decided to dump out a bunch of flour onto the floor (Ogre must have made pancakes for breakfast). Benji was in time and out and Ogre had to clean it up. Hee hee. Anyway, they arrived and by then, the line was gone, but all the tables were taken, so after we ordered, we had to stand around waiting for another table to clear. I grabbed a table as a couple was getting up to which another guy commented, “Man, you just swooped right in there!” I started to make a comment about us waiting for quite some time (they had just ordered), but he told me he was just kidding. Whew! I was worried we might have another Sweet Tomatoes incident! We sat down and waited for our order, it took a little bit since they were still clearing all the orders from the previous rush, but Benji enjoyed being able to see the grill from where he was seated and at times, the fire would get really big! I noticed that Benji kept saying, “Is Mommy alright? Is Benji alright?” I asked Ogre if they were listening to Cheap Trick in the car. Apparently, they were. Ogre grabbed our lunch and drinks and we all dug in. 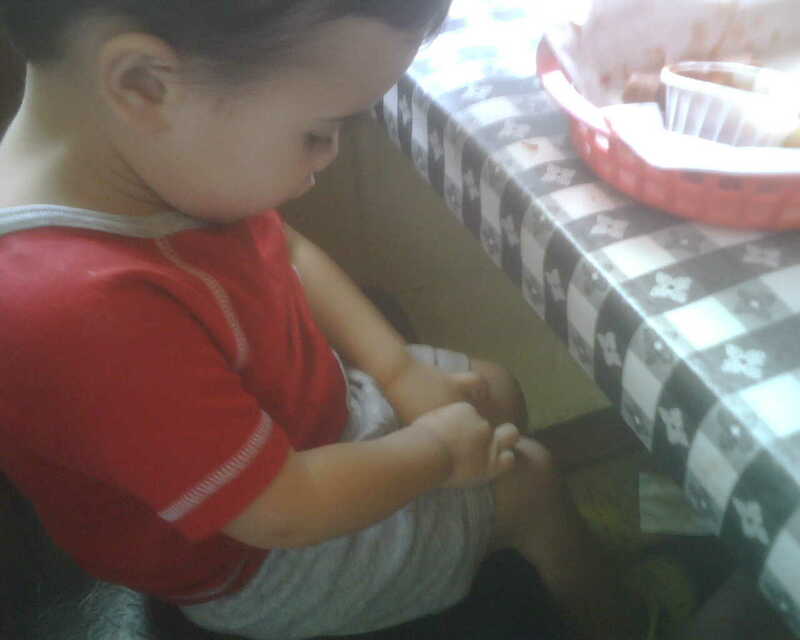 Benji was dipping his hot dog pieces into his ketchup and asking to wipe his hands with a napkin, then stuffing the napkin between his legs. He’s caught on that we put our napkins in his lap and likes to do that too! 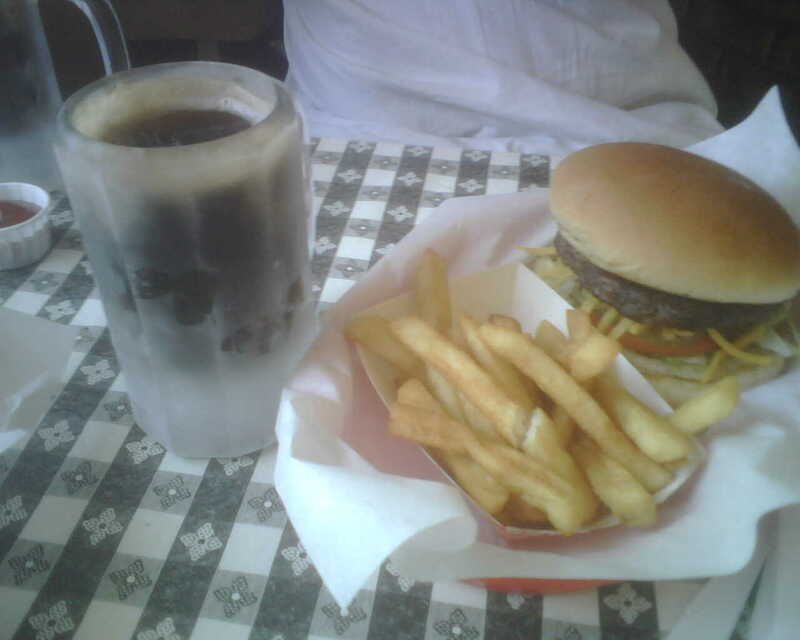 Ogre had to get a couple of refills on his mug root beer as he loves the stuff here, I think they said it was “home made.” I enjoyed it also. I don’t drink much soda anymore. We only had one episode of misbehavior from Benji who took his shoes off and tried to run around in circles. Luckily, we were about finished with lunch when he started doing this, so I just had Ogre corral him and put his shoes on so we could head home. I ordered the Cheeseburger (#10). The burger is charbroiled on a charcoal grill and the flavor was great! The burger was nice and thick (but not too thick) and juicy! 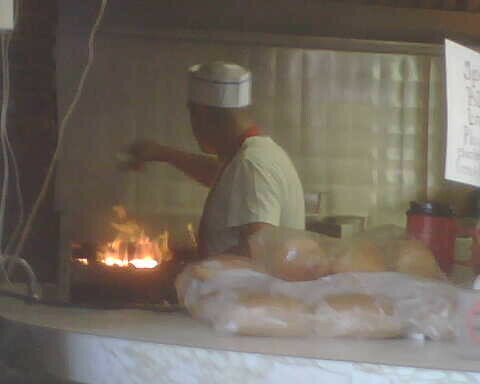 The buns are also lightly grilled. I enjoyed every bite and it was worth the subsequent heartburn! Ogre has never ordered a burger here! 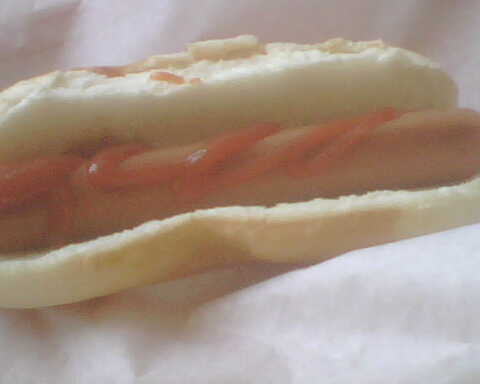 He gets the chili cheese dog, which is actually served like a sandwich. 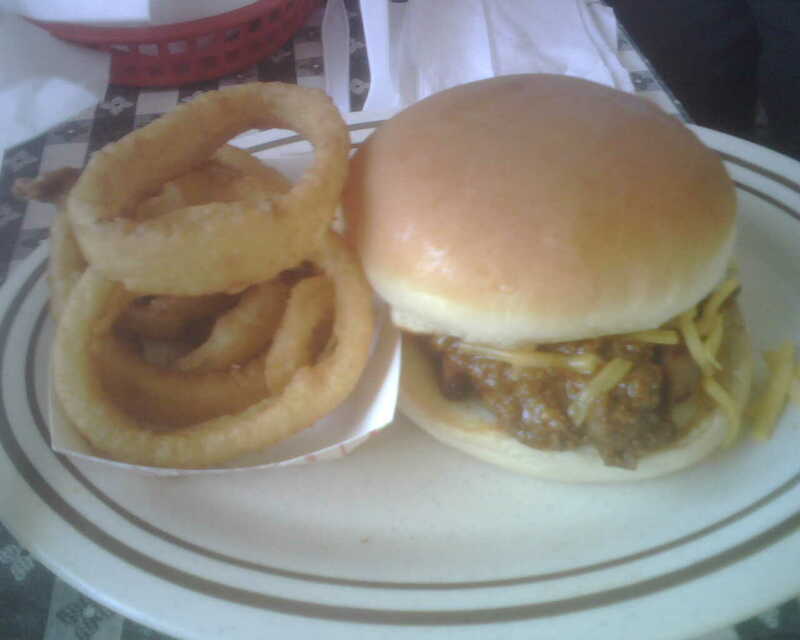 They cut up the dog, put the chili cheese on top and that all goes between two hamburger buns. Ogre can’t say enough good things about their hot dogs! Benji had a regular hot dog and ate every bite including some of the bun! Well, Ogre says it’s kid friendly since it’s burgers and dogs! It’s definitely a laid back burger joint. I thought this was one of the best burgers I’ve had in quite some time! Of course we’ll be back! Their website is www.delsburgers.com, but does not seem to be working right now. I like how he says before they start playing, “Here’s a song for those of you with weird parents.” Hmm, I think Benji and Mina can relate….